What a great read. 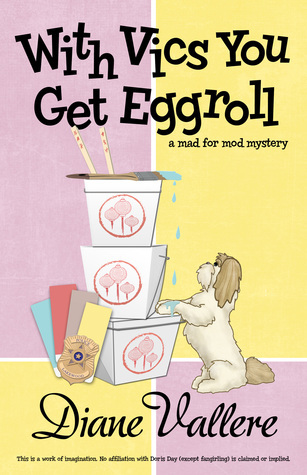 With Vics You Get Eggroll is the third book in Diane Vallere’s Mad for Mod series, but it’s my first introduction to her writing. I’m kicking myself for not having read this series from the start; I really enjoyed it. A string of abductions has everyone in town worried and on edge, including designer Madison Night. She’s no stranger to murder investigations but she’s shocked to find that her friend, police lieutenant Tex Allen, is a person of interest in the crimes. Madison can’t believe Tex has anything to do with the missing women or the bodies that have shown up. When Tex takes a leave from the force, Madison decides she needs to help clear Tex’s name–whether he likes it or not. Diane Vallere crafts a solid and suspenseful plot that carries readers along page by page. I found it hard to put the book down! I like the characters, was charmed by the Doris Day themed design descriptions, and got all tangled up emotionally in Madison’s love triangle with Tex and handsome handyman Hudson (#TeamHudson!). I really like how the plot narrows, starting out with people and places that only peripherally relate to Madison and slowly circling in to affect not only Madison herself, but those around her, including friends, clients, and neighbors. This is a fun, engaging, and exciting mystery and I’m really looking forward to catching up on the first two books and enjoying future installments of the Mad for Mod series. My thanks to the team at Henery Press for the NetGalley copy of this book in exchange for an honest review.